Google has apparently been testing a file manager app called Files Go that is currently listed on Google Play as an unreleased app. That means you can’t install it or anything because it was likely released only to a limited group. However, the file is now floating across these fine internet waves and is available, should you be interested in checking it out. Files Go is actually a pretty cool little file manager. 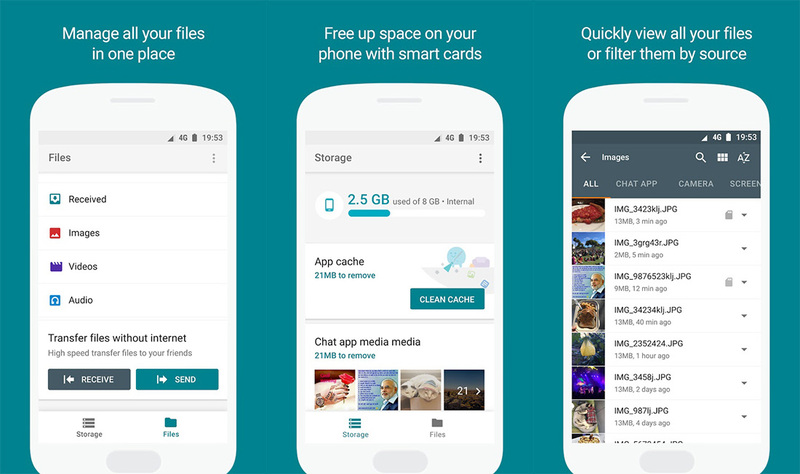 It’s basic goal is to help you manage storage by offering up suggestions of files, apps, images, cache, etc. that you might want to consider deleting to free up space. When you load the app up, it refreshes to see if there are areas it could help you improve upon. From within each section, you’ll get to pick and choose files or apps to remove and then receive a sort of “Congratulations!” after it completes the task. Where I think the app is a big deal is in its ability to share files with another person, even if you are offline. There are send and receive buttons in the Files section of that app that allow you to directly connect to another person to send files to. I just tried it and it works about as neatly as you imagine, plus it keeps a list of all of the files you’ve received. Again, the app isn’t released publicly yet, but the .apk file is around if you look in the right places (like below). A Fresh Look at the Essential Phone: Worth It Now?